Objective To assess the effectiveness of a home based early intervention on children’s body mass index (BMI) at age 2. Setting The Healthy Beginnings Trial was conducted in socially and economically disadvantaged areas of Sydney, Australia, during 2007-10. Participants 667 first time mothers and their infants. Intervention Eight home visits from specially trained community nurses delivering a staged home based intervention, one in the antenatal period, and seven at 1, 3, 5, 9, 12, 18 and 24 months after birth. Timing of the visits was designed to coincide with early childhood developmental milestones. Main outcome measures The primary outcome was children’s BMI (the healthy BMI ranges for children aged 2 are 14.12-18.41 for boys and 13.90-18.02 for girls). Secondary outcomes included infant feeding practices and TV viewing time when children were aged 2, according to a modified research protocol. The data collectors and data entry staff were blinded to treatment allocation, but the participating mothers were not blinded. Results 497 mothers and their children (75%) completed the trial. An intention to treat analysis in all 667 participants recruited, and multiple imputation of BMI for the 170 lost to follow-up and the 14 missing, showed that mean BMI was significantly lower in the intervention group (16.53) than in the control group (16.82), with a difference of 0.29 (95% confidence interval −0.55 to −0.02; P=0.04). Conclusions The home based early intervention delivered by trained community nurses was effective in reducing mean BMI for children at age 2. Trial registration Australian Clinical Trial Registry No 12607000168459. Infant feeding practices, including breast feeding14 15 and the timing of the introduction of solids,16 17 as well as children’s eating habits18 and time spent watching television (TV),19 20 are among the most identifiable factors contributing to early onset of childhood obesity.13 Infant feeding practices not only influence children’s eating behaviours but also lay the foundation for adult eating habits.21 There is also evidence that the early risk factors for obesity are more prevalent in lower socioeconomic groups.22 Few high quality interventions aimed at preventing early onset overweight or obesity among young children have been implemented effectively or rigorously evaluated.23 A 2010 updated systematic review of interventions to prevent obesity in 0-5 year olds concluded that behaviours that contribute to obesity can be influenced positively in a range of settings.24 The review noted, however, that most research has lacked good design, long term follow-up, or weight measurement. In 2007, we started the Healthy Beginnings Trial to deal with this evidence gap.25 This is a randomised controlled trial designed to test the effectiveness of an early childhood obesity intervention in the first two years. It is a staged home based early intervention designed to improve infant feeding practices, eating habits, and active play and to reduce TV viewing time, as well as improve family behavioural risk factors for childhood obesity. The trial was undertaken in some of the most socially and economically disadvantaged areas of Sydney, where there is a great need for social support. We have previously reported significant improvements at 12 months in duration of breast feeding, appropriate timing of introduction of solids, and practice of “tummy time” (a colloquial term used to encourage parents to ensure that their babies spend time in the prone position when they are not sleeping) among those receiving the intervention.26 We examined whether this home based early intervention could be also effective in reducing body mass index (BMI) for children at age 2. Research assistants gave pregnant women attending antenatal clinics a letter of invitation and information about the study. Women were eligible for the trial if they were aged 16 and over, expecting their first child, between weeks 24 and 34 of pregnancy, able to communicate in English, and lived in the local area. The recruitment took almost 12 months to complete. Of 2700 mothers who were approached by research assistants, 780 were eligible. We could not establish the eligibility of the others as they declined to participate when approached and we were not able to obtain further information. Once eligibility was established and consent obtained, women were asked to complete a registration form to allow the nurses to make arrangements for baseline data collection. One of four research nurses conducted the baseline assessments at the woman’s home before randomisation. Because of resource (research staff) constraints we were not able to complete the baseline assessment and randomisation for all participating mothers as planned before they gave birth. Four hundred and nine women were interviewed before birth and 258 after birth. The sample size calculation was based on the primary outcome, BMI, which was assumed to have a SD of 1.5. To have 80% power to detect a difference in mean BMI of 0.25 units between the groups at age 2 at the two sided 5% significance level, we needed a sample size of 252 per group. To allow for an estimated 20% drop out we aimed to recruit 630 first time mothers. Random allocation was concealed by sequentially numbered, sealed opaque envelopes containing the group allocation, which was determined by a computer generated random number with a block size of 50 with a 1:1 allocation ratio. Immediately after baseline data collection, the nurse opened the sealed envelope and informed the mother of her group. Two research assistants not involved in the implementation of the intervention collected outcome data in the woman’s home. The data collectors and data entry staff were blinded to treatment allocation, but the participating mothers were not blinded. I am part of an active family. Four community nurses were recruited and trained to ensure consistency of delivering the intervention. The nurse visited participating families in the intervention group eight times at home, once at 30-36 weeks’ gestation and seven times after the birth (at 1, 3, 5, 9, 12, 18 and 24 months). The timing of the visits corresponds to milestones in early childhood development. At each visit, the nurse spent about one to two hours with the mother and infant. The nurse not only taught the mother specific skills and knowledge in relation to healthy infant feeding practices and active play (the key messages of the programme) but also discussed any issues and concerns raised by the mother. A visit checklist with standard minimum information plus additional discussion points for each key area plus appropriate resources to support each key message was developed. Four key areas included infant feeding practices, child nutrition and active play, family physical activity and nutrition, and social support. After each visit, the nurses documented all aspects of their visits with the participating families and provided regular reports to the investigators on questions and issues arising. Families in both the control and intervention group received the usual childhood nursing service from community health service nurses. All new mothers in the state of New South Wales receive at least one nurse visit for general support at home. Some vulnerable families are offered multiple home visits. To maximise the retention rate in this study, we posted home safety promotion materials to women in the control group at six and 12 months. Length—A research assistant took two measurements of length with the child in a supine position on a level floor (with a SECA 210 Infant Measuring Mat, Hamburg, Germany) and recorded it to the nearest 0.1 cm; a third measure was taken if the first two measurements differed by 0.5 cm or more, and the mean of these two or three values was calculated. Weight—The research assistant used digital scales (Tanita model 1583 Baby Scale, Tokyo, Japan) to weigh children in light clothes and no shoes. The measures were recorded to the nearest 0.1 kg. Eating habits—Mothers reported their child’s eating habits using a short food frequency questionnaire that was specifically designed to assess children’s eating habits, the validity and reliability of which were tested before this study.35 The questionnaire asked about servings of fruit and vegetables; frequency of eating snack foods (biscuits, cakes, donuts, muesli bars), potato crisps and drinking cups of soft drinks/cordials, juice, and water; and frequency of eating in front of the TV and having food as reward. We performed a complete case analysis and intention to treat analyses for each outcome. For the complete case analysis, we compared outcomes at 24 months between intervention and control groups using the two sample t test for the continuous outcome (BMI) and Pearson’s χ2 test for categorical data. We also calculated risk differences with 95% confidence intervals. All P values are two sided and significance was set at 5%. For intention to treat analyses, we used multiple imputation by chained equations to impute missing values. We imputed the BMI values that were missing for 14 infants who remained in the study at 24 months. We also imputed all missing values of BMI and the other outcomes at 24 months for a full intention to treat analysis of all 667 randomised participants. In both cases the imputation model predicting BMI was based on all plausible observed values of BMI and covariates at baseline and at 6, 12 and 24 months’ follow-up. The imputation models for the binary outcomes were logistic regression models containing exclusive breast feeding, introduction of solid food regularly, and daily practice of “tummy time” at 6 months, and being given food for reward and drinking from a cup at 12 and 24 months. We used 20 imputations each time, which gave a relative efficiency of 99%. We then calculated pooled estimates of the difference in mean BMI and of the odds ratio of having each of the binary outcomes for those in the intervention group compared with the control group. All analyses were performed with Stata version 10 (StataCorp, College Station, TX). Of 2700 mothers who were approached, 780 mothers were eligible, but 113 declined with no reasons being given. 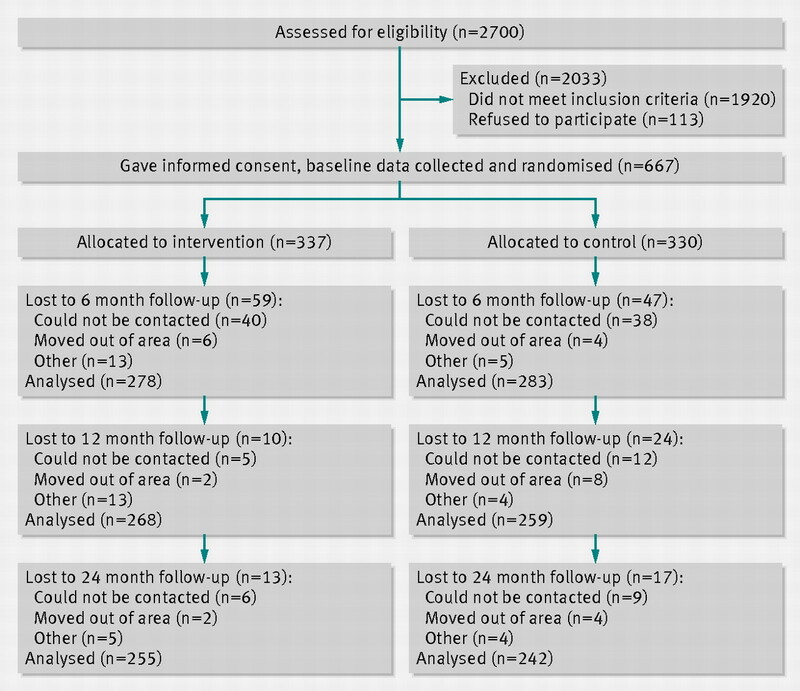 Of the 667 first time mothers recruited, 337 were randomised to the intervention and 330 to the control group (figure⇓). A total of 106 mothers were lost to follow-up at six months, a further 34 at 12 months, and another 30 at 24 months. Of the 170 lost to follow-up, 82 were from the intervention group and 88 from the control. The main reasons for loss to follow-up were: could not be contacted (70%), moved out of the area (10%), no longer interested (9%), too busy (4%), and illness or death (5%). This was similar across both groups. The women’s ages ranged from 16 to 47 with a mean of 26 (SD 5.5). Most (582, 88%) were either married or living with a partner. In total, 163 (24%) had completed tertiary education, 71 (11%) spoke a language other than English at home, 138 (21%) were unemployed, and 208 (31%) had a household income before tax of less than $A40 000 a year (£25 300, €31 300, $39 000). Table 1⇓ shows the baseline characteristics of participating mothers, which were similar for the two groups. We could not complete the baseline assessment and randomisation before birth, as planned, for 258 women (129 intervention, 129 control). There was no significant difference between these 258 and the 409 (208 intervention, 201 control) who were assessed and randomised before birth for any of the characteristics shown in table 1. At 24 months, an intention to treat analysis using all 667 participants recruited, and imputation of BMI for the 170 lost to follow-up and the 14 missing values, showed that mean BMI was significantly lower in the intervention group (16.53) than the control group (16.82), with a difference of 0.29 (95% confidence interval 0.02 to 0.55, P=0.04) (table 2⇓). For the complete cases analysis, the overall mean BMI was 16.67 (SD 1.70). The mean BMI was also significantly lower in the intervention group (16.49, SD 1.76) than in the control group (16.87, SD 1.62; P=0.01), with a difference of 0.38 (0.08 to 0.68) (table 2⇓). Adjustment for the child’s exact age with linear regression gave a similar result: a difference of 0.40 (0.09 to 0.70; P=0.01). The result was unchanged when we used multiple imputation to impute 14 missing values for the 497 who remained at 24 months. Table 2 also shows that there were no significant differences between the groups in children’s mean length or weight. In addition, 11.2% (28/249) of the intervention group and 14.1% (33/234) of the control were categorised as overweight or obese, a difference of 2.9% (−3.0% to 8.3%). As shown in table 3⇓, children in the intervention group (89%) were significantly more likely to eat one or more servings of vegetables a day than those in the control group (83%, P=0.03) and significantly less likely to be given food for reward (62% v 72%, P=0.03). The percentage of children eating dinner in front of the TV, or having the TV on during the meal, was significantly lower in the intervention group than in the control group (56% v 68%, P=0.01; and 66% v 76%, P=0.02; respectively). The intervention group also had a significantly lower percentage of children watching TV for more than 60 minutes a day than the control group (14% v 22%, P=0.02). There were no significant differences between the groups with regard to consumption of fruit, consumption of “junk food,” or time spent in outdoor play. Table 3 shows that mothers in the intervention group were significantly more likely to eat more than two servings of vegetables a day than those in the control group (52% v 36%, P<0.001) and to spend 150 minutes or more a week on physical activity than those in the control group (48% v 38%, P=0.04). There were no significant differences between the groups for other dietary behaviours assessed except for frequency of eating processed meat. The results from the intention to treat analysis with multiple imputation were consistent with those from the complete case analysis, as shown in table 4⇓. A home based intervention to prevent early childhood obesity in the first two years of life was effective, with a mean reduction in BMI of 0.29 for children at age 2. The intervention also showed some positive effects on children’s vegetable consumption, not being given food as reward, and TV viewing time, as well as mothers’ vegetable consumption and physical activity. The importance of early intervention programmes is based on the premise that the first few years of a child’s development are crucial in setting the foundation for lifelong learning, behaviour, and health outcomes.40 The intervention effect on children’s BMI suggests that, in preventing early onset of childhood obesity, a range of potential risk behaviours needs to be tackled. In contrast with previous studies,24 the unique aspect of this study was that the intervention dealt with several risk factors for early obesity including infant feeding practices, children’s eating habits, and sedentary behaviours in a systematic and timely fashion. The concept of using home visiting programmes as a means of preventing health and developmental problems in children is not new.27 28 29 To our knowledge, however, they have not been applied previously to deal with risk factors for childhood obesity. Important aspects of the current intervention design were the use of community nurses and consistency of health information on infant feeding practices, nutrition, and physical activity with current recommendations that correspond to milestones in early childhood development and that were tailored to the needs of individual families. The intervention was built on evidence supporting the use of sustained home visiting programmes in improving child health. The overall research plan was transparent, with a published research protocol.25 The randomised controlled trial design means that many of the confounders are taken into account. The study was adequately powered to detect a mean difference in BMI of 0.25 between the groups. The main outcome measures were assessed with validated, well developed, and widely used population survey tools. We applied blinding to treatment allocation for data collection, data entry, and analysis, and applied intention to treat analyses with multiple imputations in data analyses. The study has several limitations. Firstly, the generalisability might be limited because of the locality of the study area. Secondly, we could not examine all of the social, cultural, economic, and environmental factors that are likely to influence childhood obesity and could not measure some secondary outcomes as planned, including parent-child interaction and family support. Furthermore, the study was limited because participating mothers could not be blinded, measures of behaviour were self reported, and a quarter (170/667) of the sample was lost to follow-up. The loss to follow-up could lead to incomplete study results and might have biased the results, although the main reasons for loss to follow-up (such as women could not be contacted, had moved out of the area, or were no longer interested or too busy, and illness or death) were similar across both groups. In addition, the loss to follow-up could potentially violate the assumption of multiple imputation by chained equations (data are missing at random), but taking interim BMI measurements into account in the multiple imputation analysis should help to reduce the bias. In conclusion, the early onset of childhood overweight and obesity would require health promotion intervention programmes to start as early as possible and to be family focused. A home based, staged intervention of multiple home visits to deal with the risk factors for childhood obesity was effective in improving children weight status and risk factors. We thank all the participating families; the associate investigators (Anita Bundy and Lynn Kemp) and the members of the steering committee and working group for their advice and support; members of the project team including Carol Davidson, Cynthia Holbeck, Dean Murphy, Lynne Ireland, Brooke Dailey, Kerrie Ruff, Emma Wood, Kim Caines. and Angela Balafas; Maria Domenico for conducting the telephone interview at six months; James Kite and Therese Carroll for their support in setting up the database and Hui Lan Xu for assisting with data entry and analysis; and Garth Alperstein for his contribution to the development of the trial and the procurement of the funding. Contributors: LMW, LAB, and CR conceived the Healthy Beginnings Trial and contributed to the development of the trial and the procurement of the funding. In this study, LMW undertook the literature review, data analysis and interpretation, and wrote the original draft. JMS provided advice on data analysis. LAB, JMS, and CR commented on the draft. KW coordinated the implementation of the intervention and commented on the draft. VF provided advice on dietary measures and commented on the draft. All authors have read and approved the final manuscript. LMW is guarantor. Funding: This study was funded by the Australian National Health and Medical Research Council (ID No 393112). Ethical approval: This study was approved by the ethics review committee of Sydney South West Area Health Service (RPAH Zone, Protocol No X10-0312 and HREC/10/RPAH/546). World Health Organiaation. Childhood overweight and obesity, 2011. www.who.int/dietphysicalactivity/childhood/en/. de Onis M, Blossner M, Borghi E. Global prevalence and trends of overweight and obesity among preschool children. Am J Clin Nutr2010;92:1257-64. 2007 Australian National Children’s Nutrition and Physical Activity Survey, 2008. www.health.gov.au/internet/main/publishing.nsf/Content/66596E8FC68FD1A3CA2574D50027DB86/$File/childrens-nut-phys-survey.pdf. Stocks T, Renders CM, Bulk-Bunschoten AMW, Hirasing RA, Buuren S, Seidell JC. Body size and growth in 0- to -4-year-old children and the relation to body size in primary school age. Obes Rev2011;12:637-52. Laitinen J, Power C, Jarvelin M. Family social class, maternal body mass index, childhood body mass index, and age at menarche as predictors of adult obesity. Am J Clin Nutr2001;74:287-94. Tsukada H, Miura K, Kido T, Saeki K, Kawashima H, Ikawa A, et al. Relationship of childhood obesity to adult obesity: a 20-year longitudinal study from birth in Ishikawa Prefecture, Japan. Jpn J Publ Health2003;50:1125-34. Ong KK, Emmett PM, Noble S, Ness A, Dunger DB, ALSPAC Study Team. Dietary energy intake at the age of 4 months predicts postnatal weight gain and childhood body mass index. Pediatrics2006;117:e503-8. Gardner DSL, Hosking J, Metcalf BS, Jeffery AN, Voss LD, Wilkin TJ. Contribution of early weight gain to childhood overweight and metabolic health: a longitudinal study (EarlyBird 36). Pediatrics2009;123:e67-73. Stettler N, Iotova V. Early growth patterns and long-term obesity risk. Curr Opin Clin Nutr Metab Care2010;13:294-9. Ciampa PJ, Kumar D, Barkin SL, Sanders LM, Yin HS, Perrin EM, et al. Interventions aimed at decreasing obesity in children younger than 2 years: a systematic review. Arch Pediatr Adolesc Med2010;164:1098-104. Leunissen RWJ, Kerkhof GF, Stijnen T, Hokken-Koelega A. Timing and tempo of first-year rapid growth in relation to cardiovascular and metabolic risk profile in early adulthood. JAMA2009;301:2234-42. Monteiro P, Victora C. Rapid growth in infancy and childhood and obesity in later life— a systematic review. Obes Rev2005;6:143-54. Taveras EM, Gillman MW, Kleinman K, Rich-Edwards JW, Rifas-Shiman SL. Racial/ethnic differences in early-life risk factors for childhood obesity. Pediatrics2010;125:686-95. Arenz S, Rükerl R, Koletzko B, von Kries R. Breast-feeding and childhood obesity—a systematic review. Int J Obes Relat Metab Disord 2004;28:1247-56. Armstrong J, Reilly JJ. Breastfeeding and lowering the risk of childhood obesity. Lancet2002;359:2003-4. Griffiths LJ, Smeeth L, Hawkins SS, Cole TJ, Dezateux C. Effects of infant feeding practice on weight gain from birth to 3 years. Arch Dis Child2009;94:577-82. Kramer MS. Breastfeeding, complementary (solid) foods, and long-term risk of obesity. Am J Clin Nutr2010;91:500-1. Dennison B, Erb T, Jenkins P. Television viewing and television in bedroom associated with overweight risk among low-income preschool children. Pediatrics 2002;109:1028-35. Salmon J, Campbell K, Crawford D. Television viewing habits associated with obesity risk factors: a survey of Melbourne schoolchildren. Med J Aust2006;184:64-7. Birch LL. Development of food preferences. Annu Rev Nutr1999;19:41-62. Wake M, Hardy P, Canterford L, Sawyer M, Carlin JB. Overweight, obesity and girth of Australian pre-schoolers: prevalence and socio-economic correlates. Int J Obesity2007;31:1044-51. Summerbell CD, Waters E, Edmunds LD, Kelly S, Brown T, Campbell KJ. Interventions for preventing obesity in children. Cochrane Database Syst Rev2005;3:CD001871. Hesketh KD, Campbell KJ. Interventions to prevent obesity in 0-5 year olds: an updated systematic review of the literature. Obesity2010;18:S27-35. Wen LM, Baur LA, Rissel C, Wardle K, Alperstein G, Simpson JM. Early intervention of multiple home visits to prevent childhood obesity in a disadvantaged population: a home-based randomised controlled trial (Healthy Beginnings Trial). BMC Public Health2007;7:76. Wen LM, Baur LA, Simpson JM, Rissel C, Flood VM. Effectiveness of an early intervention on infant feeding practices and “tummy time”: randomized controlled trial. Arch Pediatr Adolesc Med2011;165:701-7. Olds DL, Eckenrode J, Henderson C R, Kitzman J, Powers J, Cole R, et al. Long-term effects of home visitation on maternal life course and child abuse and neglect. JAMA1997;278:637-43. Olds D, Kitzman H, Hanks C, Cole R, Anson E, Sidora-Arcoleo K, et al. Effects of nurse home visiting on maternal and child functioning: age-9 follow up of a randomised trial. Pediatrics 2007;120:e832-45. Armstrong KL, Fraser JA, Dadds MR, Morris J. Promoting secure attachment, maternal mood and health in a vulnerable population: a randomised controlled trial. J Paediar Child Health2000;36:555-62. Wen LM, De Domenico M, Elliott D, Bindon J, Rissel C. Evaluation of a feasibility study addressing risk factors for childhood obesity through home visits. J Paediar Child Health2009;45:577-81. National Health and Medical Research Council. Dietary guidelines for children and adolescents in Australia: incorporating the infant feeding guidelines for health workers. Commonwealth of Australia, 2003. www.nhmrc.gov.au/_files_nhmrc/file/publications/synopses/n34.pdf. Australian Department of Health and Aged Care. National physical activity guidelines for adults and children. Australian Government. www.health.gov.au/internet/main/publishing.nsf/content/health-pubhlth-strateg-phys-act-guidelines#guidelines_adults. Cole TJ, Faith MS, Pietrobelli A, Heo M. What is the best measure of adiposity change in growing children: BMI, BMI%, BMI z-score or BMI centile? Eur J Clin Nutr2005;59:807. Cole TJ, Bellizzi MC, Flegal KM, Dietz WH. Establishing a standard definition of child overweight and obesity worldwide: international survey. BMJ2000;320:1240-3. Flood V, Wen LM, Hardy L, Thrift A, Simpson J, Rissel C, et al. Reliability and validity of a short food frequency questionnaire to assess diet among 2-5 year olds. Obes Res Clin Pract2010;4(suppl 1):S61. Wen LM, Van der Ploeg HP, Kite J, Cashmore A, Rissel C. A validation study of assessing physical activity and sedentary behavior in children aged 3 to 5 years. Pediatr Exerc Sci2010;22:408-20. Centre for Epidemiology and Research. 2006 report on Adult Health from the New South Wales Population Health Survey. NSW Department of Health, 2007. Wen LM, Flood V, Simpson J, Rissel C, Baur L. Dietary behaviours during pregnancy: findings from first-time mothers in southwest Sydney, Australia. Int J Behav Nutr Phys Act2010;7:13. Wen LM, Baur LA, Rissel C, Flood V, Simpson JM, Hayes A, et al. Healthy Beginnings Trial phase 2 study: follow-up and cost-effectiveness analysis. Contemp Clin Trials2012;33:396-401. Gauntlett E, Hugman R, Kenyon P, Logan P. A Meta-analysis of the impact of community-based prevention and early intervention, 2001. www.fahcsia.gov.au/about/publicationsarticles/research/socialpolicy/Documents/prp11/PRP_No_11.pdf.